The patient was a very pleasant 43-year-old male presenting to the clinic with acute onset of low back pain that started 7 days ago after performing some heavy lifting at work. The pain was in the lumbosacral region and right sacral leg joint region and surrounding musculature that radiated into the posterior aspect of the right leg. No numbness or tingling was present. No loss of bowel or bladder control. Any type of movement that involves bending and twisting greatly exacerbates the pain. The pain is constant and especially worse in the mornings. The patient presented with inability to fully weight-bear on the right leg and thus presented with a right limp. The patient indicated that he had not experienced prior symptoms similar to his current complaints and was symptom-free at the time of the incident above. The patient’s medical, surgical, and family history was unremarkable. He is a healthy Hispanic male. His superficial appearance did not indicate any apparent distress. Further, observation showed minor’s sign to be present. This sign is present when the patient, in arising from a chair, leans forward, jackknifing the thighs and the dorso-lumbar spine so that the head is over the feet. Using the hands on the thighs or the arms of the chair, the patient pushes the body to an upright position, thus sparing lower limb effort. The presence of this sign is usually indicative of sciatica. There was no apparent spine tilt with him standing upright. The patient was 5 feet 8 inches at 156 pounds, well-developed with a body temperature of 99.2°F. His blood pressure was slightly elevated at 149/81 mm Hg and a heart rate at 72 beats per minute. On examination, the eyes, ears, and throat appeared normal. Gait analysis reveals complete loss of normal gait pattern greatly favoring his left leg. The patient’s range of motion was decreased in all ranges with pain and spasm in the erector spinae muscles including the iliocostalis lumborum and iliocostalis thoracics muscles bilaterally. Muscles of the lower extremity were 5 out of 5 for all muscles in the left leg. A 3 out of 5 test was noted in right anterior tibialis muscle and right extensor hallucis longus muscle. No atrophy was noted. The patient’s deep tendon reflexes of the upper and lower extremities were noted to be a 2+ rating bilaterally for patellar and Achilles. Cranial nerve testing also showed to be normal. The patient had normal sensation symmetrically and bilaterally. Orthopedic testing showed positive straight leg raise test both in the supine and seated position (slumps) with reproduction of patient shooting pain along the posterior aspect of the right leg with a patient audible response due to the severity of pain. Bechterew’s test also showed positive on the right side. Palpation of the lumbar spine showed tenderness along L3-L5 facet joints and surrounding musculature. Spasming noted in during palpation of the erector spinae muscles bilaterally. Edema is noted in this region as well. A full spine weight bearing radiographic study was taken (utilizing views: APOM, AP cervical, AP Thoracic, AP lumbopelvic, lateral cervical, lateral thoracic, and lateral lumbar). 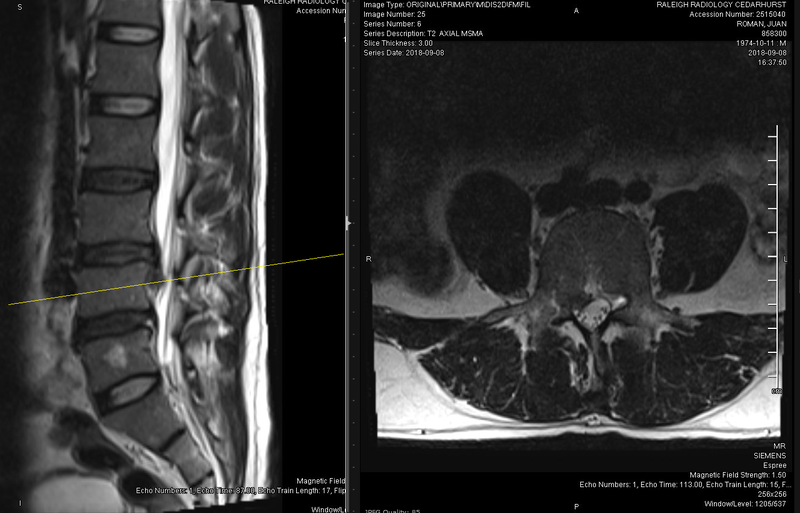 An MRI of the lumbar spine was also ordered immediately before beginning treatment. See figures below. The radiographic study showed loss of normal lumbar lordosis consistent with an acute injury. No degenerative changes are present. Neural foramina appear patent. No evidence of fracture or dislocation. A moderate left list of the lumbar spine is noted consistent with a disc injury. Acetabular joints appear normal. The adjacent soft tissue appears normal. Image 1 – loss of lumbar lordosis with left list, Antalgia, seen on radiograph. MRI Study was reviewed, and findings included: Marrow edema was normal with no signs of fracture. The vertebral alignment showed loss of normal lumbar lordosis and caddy lever appearance of L3 on L4. Hemangiomas noted at L1 and L5 in trabecular bone vertebral bodies. Conus medullaris and cauda equina appear normal. There is a T2 hyperintense signal cystic structure noted at the posterior aspect of the conus medullaris at T12-L1. This is incompletely evaluated in this study. L1-L2 appears normal with no stenosis of the neural foramina or central canal. L2-L3 shows posterior central annular fissure. The high signal in this fissure indicates it is acute. No central canal or neural foraminal stenosis. 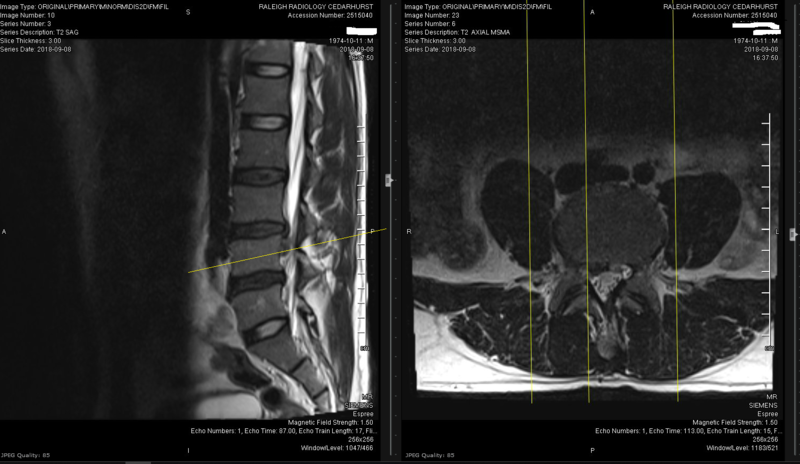 L3-L4 showed mild disc bulging with a superimposed right paracentral disc extrusion1 at L3-L4 with migration inferior-ward displacing the thecal sac and the fourth lumbar nerve root before it reaches the L4-L5 neural canal on the right. L4-L5 shows moderate disc bulging with a superimposed posterior left paracentral disc protrusion type herniation with an annular fissure. Due to the high signal in this fissure, it is most likely acute. L5-S1 appears normal with no central canal or neural foraminal stenosis. Recommendations included a thoracic spine study to assess cystic lesion as noted above. Immediate neurosurgical consultation is also recommended. See Images 2 through 5 below. Image 2 – extrusion herniation with inferior migration. Image 3 – displacement of thecal sac posteriorly on the right side. Image 4 – compression occurring just before neural canal but displacing L4 nerve. Image 5 – Neural Canals are patent. After MRI results were reviewed patient was immediately referred for a neurosurgical consult. Neurosurgical consultation recommended that the patient is removed from his repetitive occupation for 2 weeks and begin oral steroid treatment. After a few weeks, the patient reported that he had significantly improved and is now able to perform all activities of daily living including work with no discomfort. Based upon the neurosurgeon’s recommendation, collaborative care with chiropractic treatment will commence ensuring biomechanical stability. NOTE ON STEROID USE WITH MECHANICAL SPINE ISSUES: Goldberg et al. (2015) reported: Despite conflicting evidence, epidural steroid injections are frequently offered under the assumption that radicular symptoms are caused by inflammation of the affected lumbar nerve root. Epidural steroid injections are invasive, generally, require a pre-procedure magnetic resonance imaging (MRI) study and expose patients to fluoroscopic radiation. Also, the US Food and Drug Administration recently warned of rare, but serious neurologic sequella from [epidural steroid injections]. Oral administration of steroid medication may provide similar anti-inflammatory activity, does not require an MRI or radiation exposure, can be delivered quickly by primary care physicians, carries less risk, and would be much less expensive than an [epidural steroid injection]. Oral steroids are used by many community physicians, have been included in some clinical guidelines, and are noted as a treatment option by some authors. However, no appropriately powered clinical trials of oral steroids for radiculopathy have been conducted to date. To address this issue, we performed a parallel-group, double-blind, randomized clinical trial of a 15-day tapering course of oral prednisone vs. placebo for patients with acute lumbar radiculopathy associated with a herniated lumbar disk... (p. 1916). Although the patient presented with some classical signs of disc injury, some signs of disc injury were not present: Antalgia, numbness or tingling in the lower extremity or loss of bowel or bladder control. The outstanding feature of this case was the motor deficit noted in the right anterior tibialis and right extensor hallux longus muscle both having their roots in L4 and L5. It is important to note, however, that positive orthopedic testing with production radicular pain without motor or sensory loss is still an indication for advanced imaging particularly with straight leg raise (SLR) and slumps test3. One study showed that adding hyperextension test and Bell test to the straight leg raise test have shown to be more sensitive and specific than the SLR test alone4. The patient had not been evaluated by any other physician before being evaluated by us. This is a clear example although the patient did not have all the signs indicating acute disc injury, severe disc injury indeed occurred. The patient’s inability to axial load during a range of motion testing is also demonstrated by the two acute annular fissures as noted above. 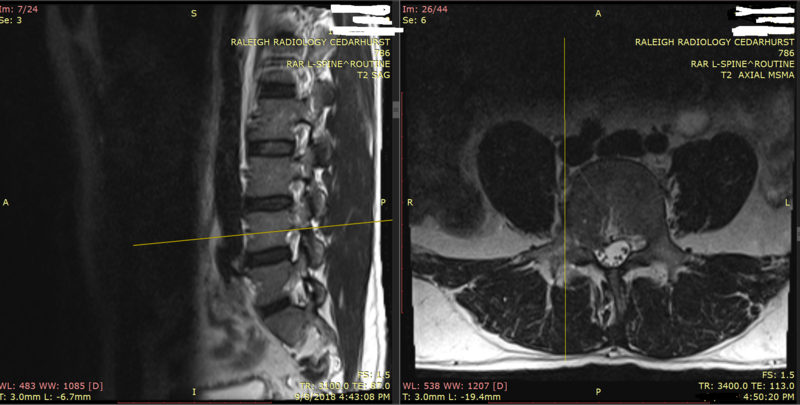 Chiropractic manipulation is contraindicated in this case due to the severe extruded disc at L3-L4 with migration. Advanced imaging, particularly Magnetic resonance imaging, in this patient’s case significantly improved our ability to give an accurate diagnosis and prognosis of their condition. David F. Fardon, MD, Alan L. Williams, MD, Edward J. Johring, MD, F. Reed Murtagh, MD, Stephen L. Gabriel Rothman, MD, Gordon K Se, MD. Lumbar disc nomenclature: Inversion 2.0 recommendations of the combined task forces of the North American Spine Society, the American Society of spine radiology and the American Society of Neuroradiology. Goldberg, H., Firtch, W., Tyburski, M., Pressman, A., Ackerson, L., Hamilton, L, Avins, A. L. (2015). Oral steroids for acute radiculopathy due to a herniated lumbar disk: A randomized clinical trial. Journal of the American Medical Association (JAMA), 313(19), 1915-1923. Majlesi J, Togay H, Unalan H, Toprak S. J Clin Rheumatol. The sensitivity and specificity of the Slump and the Straight Leg Raising tests in patients with lumbar disc herniation. 2008 Apr;14(2):87-91. doi: 10.1097/RHU.0b013e31816b2f99. Rob Simpson, Hugh Gemmell. Accuracy of spinal tests: a systematic review. Chiropractic & Osteopathy 2006, 14:26.